-Back in stock! New versions of Absurd's classics. -A breeze of the 90's, a sound so razorsharp, and hailing from the Northern lands of Norway. -Opus Funaerum is the solitary black candle that illuminates the all-consuming darkness of obscurity and mysticism. -Old school Black Metal influenced by Megiddo and early Bathory. -Hateful Black Metal for those into Peste Noire and Horna. -Phenomenally catchy raw Black Metal from the San Francisco Bay Area. -Polish hateful Black Metal at his climax, highly recommended! -Black Metal from the Netherlands released under the wings of Zinarthan Productions. -Slow, deep and sad melancholic melodies worship the prevalence of death. -Primitive and crushing barbarian black/death from Australia. -The first demo from this mysterious duo now available, presenting two instrumental tracks of Post Black Metal art with magnificent musicality. -Depressive Black Metal from Finland. -Grim and blasphemous Black Metal recorded following the underground tradition. -Radical and politically incorrect! Polish Black Metal from the front lines. -Title says enough. Limited edition, released on pro tape by Heidens Hart. -Back in stock! Conceptual album including four untitled tracks for over an hour of desolate Black Metal. -Raw satanic worship, no compromise! -Mandatory cult Black Metal from Finland. 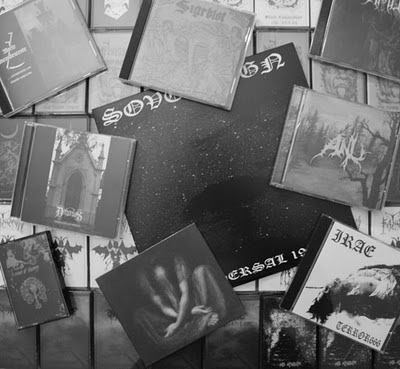 -Epic Black Metal taking you back to the 90's when Black Metal still meant originality and unique concepts. -Obscure ultra raw extreme Doom on Bubonic Productions. -Darken's fourth masterpiece Ambient Pagan music with some tribal drums. -Raw Punk induced Black Metal like Ildjarn and Bone Awl. -Raw underground Black Metal split between united States and Ireland. -Skull crushing Portuguese Black Metal featuring members of Irae and Corpus Christii. -Negative Black Metal on Bubonic Productions. -Goat worshipping Black War Metal desecration, second edition. -The Forgotten is a step into hateful black metal orthodoxy, surpringly appealing. -Rehearsal tape released by the band. -Post-Black Metal with an experimental edge, well-done. -Raw and powerful blackened Punk live recording. -Raw Black Metal filth produced by Glaveless Slumber Records. -A mandatory Black Metal recording. -Raw, un-hinged death, distorted and seriously unrelenting sharing members from fellow Toronto speed-freaks The Endless Blockade and Rammer. -Slunovrat is very promising heathen Black thrashing Metal band, composed from musicians with longtime music-creation experience. -Three unreleased tracks from the earliest Sovereign recordings, pure Brazilian raw Black Metal. -Only a few copies available. -Freezing northern misanthropic Black Metal art with amazingly artistic heavy metal-ish solos throughout. -Back in stock! Profound mysteries, distant emotions and soundscapes from beyond our origins, highly recommended! -Melancholic Black Metal, based in a poem book from F.'s grandfather, found after he died. -A compilation gathering some of the best recording from that far-right Italian Black Metal horde. -Debut album of the German cult Black Metal horde. -A step forward into darkness. "The time has finally come to announce the end of Marblebog. My new ideas are so far from Black Metal, so far from anything I’ve done under this name, that the right thing is to let Marblebog rest in peace. Three full-lengths, a couple of splits and a show in America; I achieved much more than I dreamed of at the beginning, I expressed everything I could within the borders of Marblebog, there is nothing more left to say. You’ll be updated about my new band, but nothing is fixed yet, only that it will have nothing to do with Black Metal. LP version of "Csendhajnal" and "Wind of Moors" once labels will actually do something other than postponing release dates (no offense). Marblebog legacy won't be forgotten. Tour de Garde's Marblebog "Wind of Moors" CD and Marblebog/Draugurz "Split" CD are still available from us as well as some distributed titles, browse our list.